Imagine the potential from seeing your ad here. Contact us to find out more. If the famous Willy Wonka vacationed in Maine, Len Libby’s would certainly be on his travel itinerary. 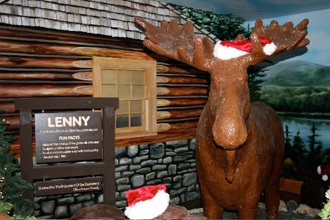 Located in Scarborough, the store is known for both its handmade confections and Lenny, the world’s only life-sized chocolate moose. Just walking into Len Libby’s brings you to a place of your grandparents’ childhood. Saltwater taffy sits in bins waiting to be scooped; solid chocolate bars in gold wrapping are stacked to the sky; silver tins burst with bricks of fudge next to homemade lollipops all in a row. Without a doubt, Len Libby Candies is a sweet-lover’s wonderland. Founded in 1926 by Len Libby, a master candy-maker from Portland, Maine, the store was first located near Higgins Beach on US Route 77, then moved to a much larger and busier location on US Route 1 after it was bought by Fernand Hemond in 1949. Len Libby's is currently run by the Hemond family, who have continued the excellent Len Libby’s traditions and added some of their own. The holiday season is a particularly special time at the store. Kids revel in the annual candy cane event, where they are invited to ride a horse-drawn carriage before molding their very own candy canes by hand. 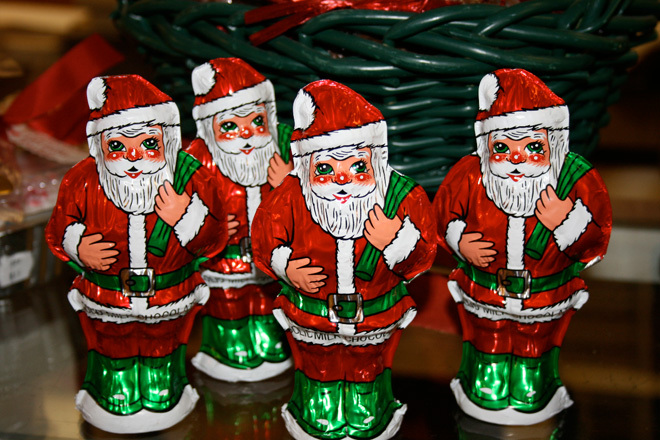 On the way out the door, parents might find themselves drawn to the more exotic candy cane flavors: clove, eggnog, and bubble gum, to name just a few. 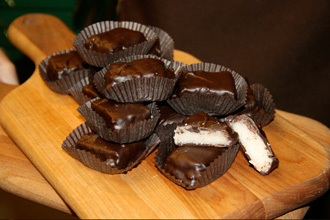 Needhams are a Maine tradition, but only Len Libby’s Needhams are made with fresh coconuts. The process is simple. First, whole coconuts are cracked open with a hatchet and the meat shredded. The milk is set aside for later use. Following a secret recipe, the contents are cooked and cooled on a marble table before being dipped in their signature chocolate. The result is the creamiest, most delectable candy in the world. I grew up eating Bangor Taffy, but I never knew that it had such an interesting history. Back in the early 1900s, when train travel was in its heyday, a candy-maker from Bangor came up with the idea to sell directly to passengers. Soon, he was a fixture on the Maine Central Railroad, where he’d sell his buttery caramel squares dipped in powdered sugar for a penny. As the need for Bangor Taffy extended to the Bangor, Portland, and Boston lines, the desire expanded. Len Libby’s became one of the first candy makers who brought this to the public. To this very day, you can purchase the original recipe for Bangor Taffy at Len Libby’s. Maybe you’d like to eat it on the way to the Polar Express via the Maine Narrow Gauge Railroad? 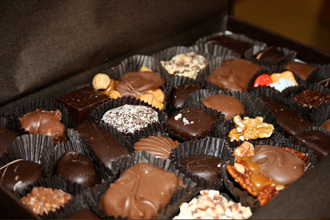 A new line of chocolates has just arrived at Len Libby’s — the Legacy Collection. These boxes of chocolate will make any candy lover swoon. Nestled in sleek boxes, the chocolates are not only a feast for the eyes, but quite possibly a feast for the soul. The Higgins Generations box features a nostalgic selection from the past— fresh coconut Needhams, almond buttercrunch, pecan, and cashew chews, all hand-dipped in milk and dark chocolate. The Pine Point collection features turtles, nougats, and nut clusters, while the Prouts Neck Preferred offers wild Maine clusters and sea salt caramels, to name a few. The Scarborough and Marshview boxes are also full of classic Len Libby goodness. Len Libby Candies is worth the trip, but if you aren’t traveling to Maine anytime soon, you can always order these tasty confections via their website. Len Libby Candies is a Maine tradition worth experiencing. ONE is not responsible for the content of external internet sites.